Launched in summer 2014 following the receipt of a $30 million federal grant, the Choice Neighborhoods Initiative employs a comprehensive strategy that addresses the major foundations for a healthy community: Housing, Neighborhood and People. Through this strategy, the development team is addressing issues such as quality mixed-income housing, infrastructure, recreational space, health and wellness, education, public safety, business and commerce and community capacity building. Key to the plan is the stipulation of a one-for-one replacement of all public and/or assisted dwelling units of Hamilton-Larimer and East Liberty Gardens, in the targeted neighborhood which will ensure that the neighborhood does not see any reduction in the supply of affordable housing. Development activity will produce 334 units of mixed-income housing, ranging from unrestricted market rate units to low-income affordable units. The plan includes a variety of neighborhood improvement initiatives managed by the Urban Redevelopment Authority (URA) designed to improve quality of life for the entire neighborhood. These efforts include the planning for a new multi-purpose community park on Larimer Avenue and a green infrastructure/ storm water management system. Additionally, the URA is providing aid to eligible Larimer homeowners who want to make exterior improvements to their homes through the Choice Neighborhood Homeowner Assistance Program. As construction and redevelopment efforts advance, HACP’s partners have been actively engaged with residents of both Hamilton-Larimer and East Liberty Gardens, providing a host of case management and supportive services programs designed to assist residents through the transition process. These programs include educational activities for children and youth, as well as employment assistance, human services and wellness programs for adults. Now two years into implementation, these efforts have begun to produce tangible results. For example, the average income of HUD-assisted households has increased by 24 percent; and, the percentage of 0 to 5 year-old children enrolled in early childhood education programs has increased by 36 percent. 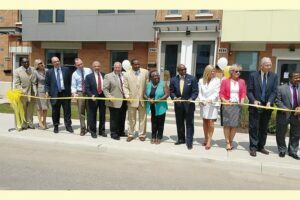 Larimer/ East Liberty Phase I includes 85 residential units which are affordable to households with a range of incomes. Project Based Housing Choice Voucher subsidies will be available for one-third of the units, one-third of the units will be affordable to households earning 60 percent or less of the Area Median Income (AMI) and one-third will be market rate units which are unrestricted by income. Thirteen units will be fully accessible. The total development cost for the planned 334-unit development, including replacement of old public infrastructure and installation of new public streets and innovative green infrastructure, is approximately $130 million. The effort will transform the Larimer/ East Liberty Choice Neighborhood mixed-income housing community into one of the greenest and highest quality affordable housing developments in the City of Pittsburgh.